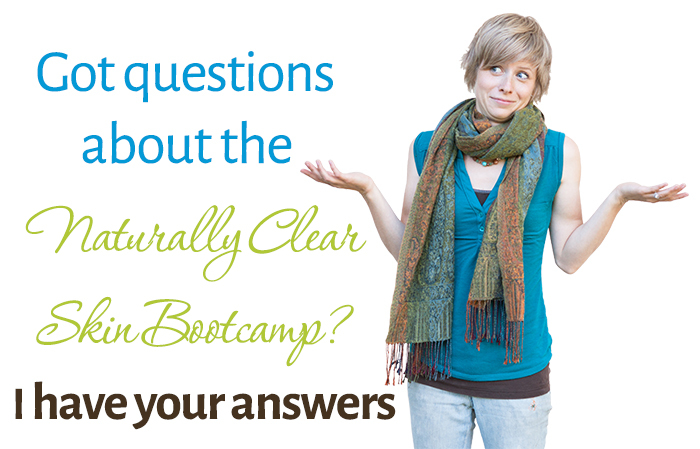 Q & A’s about the Naturally Clear Skin Bootcamp – Is It For You? Time is whittling away for the Naturally Clear Skin Bootcamp – it’s starting on March 15th 2015, which means there’s less than 4 days left to join! The 6 week Bootcamp program is going to give you the step-by-step tools, motivation, and support you need to change your lifestyle for real this time and clear your skin for good. You can still join from the 15th on but the price is going to be going up afterward, and you’re going to miss out on the AMAZING deal – which is that when you join before midnight on March 15th, you get the Naturally Clear Skin Academy as a completely free bonus (the Academy includes everything I have ever made to help you on your journey to clear skin). Perhaps the reason you haven’t signed up yet is that you still might have some hesitations about whether this program is right for you. That’s totally normal, and almost all my past participants had quite a few hesitations before signing up as well, but found that it was well worth it when they saw the results in their skin and how they feel about themselves. Will this help with MY type of acne? 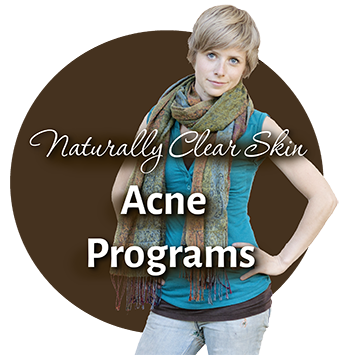 People have seen amazing results with my program no matter what type of acne they have…. 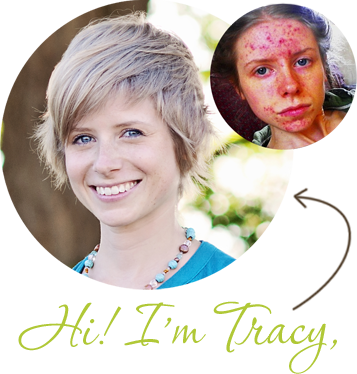 the lifestyle changes I guide you through address the underlying factors for all types of acne. Whether it’s pustules, nodules, cystic, whiteheads, blackheads – and no matter where it is – forehead, cheeks, neck, chin, back – and no matter what it’s caused by – hormones, gut, stress, coming off the pill etc – and no matter how long you’ve had it. I’m confident that my program will help you. I want to join but I can’t start on the 15th, or I have to go away for a week in the middle. How long do I get access for? When you join, you get access to all the material and the forums for life. This is an incredibly generous offer and it affords you the ability to do the course whenever it works best for you, at your own pace, and still get the support you need. What’s are the meal plans like… are they paleo, vegan, or some other category of diet? It is a whole foods diet that is dairy, gluten, soy, and refined sugar free. It includes vegetables, fruits, beans & legumes, non gluten grains, squash & sweet potatoes, coconut products, meat, eggs, seafood. If you are vegetarian, there are plenty of vegetarian meals included. If you have intolerances or just don’t like certain foods, there is an absolute ton of variety in the meal plans so you can just double up ones that you like and eliminate ones you don’t. It’s not so much the meal plan as it is the principles behind it, which means you don’t have to follow the menu exactly. Are the meals going to be really complicated and time consuming? The meals will range from 10 minutes to 45 minutes to make and are not overly complicated. The recipes and meal plans are extremely varied with new recipes for each day in order to make sure things don’t get boring, but I encourage picking and choosing ones you think look good and making large portions that will span several meals, in order to cut down on kitchen time and make this all much more do-able! What about the workouts? Are they going to be really hard and time consuming? Well they might be kind of tough but this is a Bootcamp, baby! 🙂 Oh, I kid, I kid. The workouts are for all experience levels, I just show you how to modify them if they are beyond your current ability. And they will take less than 2 hours per week to complete. Can I do it if I’m pregnant or breastfeeding? You can (with clearance from your primary health provider), but I would definitely make the diet changes much more gradually than we’re doing it in the Bootcamp and avoid certain supplements. And maybe take it a bit easier on the workouts. If you jump into lifestyle changes really quickly like we’re doing, you will often go through a ‘detox’ period where a lot of toxins get released from your body all at once to be eliminated. This could end up being harmful to your baby and we don’t want that. Can I do it if I’m a man? The Love Vitamin and my programs are obviously geared towards women, but pretty much all the information still applies to men and I’ve had a ton of men in the past get amazing results with my methods. There’s also a couple very active men participating in our forums. I want to join but I’m not sure I can afford to? I’d say you can’t afford not to! This needs to be thought of as an investment… how much of your life are you losing right now to acne? Probably a lot. is it really worth letting this get in the way of finally getting on the path to a better, happier life? Is it worth months and years of more suffering? You owe it to yourself to make this leap. I can’t advise you on your finances, but most people tend to find the money for the things that really truly matter to them. I’ve also set up a payment plan to make it as easy as possible for you. And here’s a big thing: people generally hate feeling like they wasted their money on something they never followed through on. So when people commit their hard earned money to something like this, it infinitely increases the chances that they will actually do the work and get the results. Free isn’t always best, especially if the result, ie. clear skin, means a lot to you. What format is the Bootcamp content in? Will I have to download it all? The content is delivered as a mixture of written online content, downloadable written content (files will be mainly in PDF format and sometimes Microsoft Word format if it’s a worksheet), and videos. Videos can be downloaded but can also be watched online. So you will at least need some space on your computer or phone for quite a few PDF files. I’ve tried everything! How do I know this will work when everything else hasn’t? With all love and respect – can you truly say you’ve really tried everything? If you’ve never tried this holistic stuff then you can’t say you’ve tried everything. If you have tried holistic methods- are you sure you’ve tried everything in that arena and weren’t ignoring some crucial aspect of health and natural healing? Have you dealt with self-sabotaging behaviours for good, and shed beliefs that may be holding you back despite your actions? I’m not able to call you out and say you really haven’t tried everything, but I’m willing to bet that if you haven’t gotten the results you want, you’re missing something and the Bootcamp (or the Academy content) is probably going to cover it! The Naturally Clear Skin Bootcamp is not for you if you’re after a quick-fix for your skin rather than a lifestyle change. Only join if you are committed to changing your skin and your life for good! — no excuses or ‘but I can’t because…’ defeatist attitudes, please. I can’t fix you, but I can guide you. In the end, you are the one who has to do the work! 🙂 If you’re up for that and ready to take responsibility for your situation, then please get on board! I’d love to work with you! I hope this cleared up some concerns for you. If so, please click here to join us in the Bootcamp (and as I said, you’ll get the complete Naturally Clear Skin Academy as a free bonus if you sign up before midnight on the 15th of March 2015). If you have more questions or concerns about the Bootcamp (or Academy), please ask them in the comments section below and I will answer them for you! Live Bootcamp Begins March 15th! HUGE Bonus & Savings If You Sign Up Now The Day You Said ‘HELL YES’ to a Life That is Full, Wonderful, and Everything Amazing Do You Actually Want Clear Skin Or Not? How Long Does It Take To Get Clear Skin Naturally? Hmm yes I understand that is a dilemma. People do tend to go through detox periods in the beginning… hopefully not to last that long though! Like a week or two usually, but I suppose you never know as sometimes people’s do last longer. I personally think the likelihood of things being much, much better or completely better by December is the much more likely scenario, and at the very very least, not any worse than it is currently. I am going to be traveling during this bootcamp. Will you be having this offer again? Yep…. so how it will work is that…. well from now until 6 weeks from now, each module will be posted week by week. But you can still join the Bootcamp at any time after we begin, and you will have access to all of the modules that have been posted so far. Essentially, it’s going to be an “evergreen” product that you can buy at any time and go through at your own pace and have full access to the forum and everything, but every so often, we will be doing a “live” run of the course where a big group of us start at the same time to go through it together, and do live coaching calls, each week etc, (like what’s happening now). So, in short, you can definitely join the Bootcamp in the future. But I can’t say whether or not I will have this free Academy bonus again. Do you offer a money back guarantee if this does not help at all? If so, what are the terms? I am one of those who has tried everything (short of Accutane) and already to include limited diets that proclaim to clear skin, OCM and even eft. Any feedback is greatly appreciated! Thank you. I’m considering doing the boot camp. Mostly because I would love the community and support. I’m hesitant because after months of food restrictions and still having acne, I decided that more than excluding from my diet I need to include love. I finally feel like I’m getting to a place where I love myself no matter what I look like. So I’m afraid of the food restrictions. What do you think? I have been following your blog for a while now and did a lot of your recommendations like switching to all natural face products and as well just trying to not stress about the foods I eat. I also have been on Estroblock since May and progesterone cream due to my low progesterone after getting a hormone test done. (due to getting off the pill) I really want to do this boot camp to see if my acne is possibly from food allergies but I am concerned with how it will be after the boot camp. Is this the type of thing that after getting finished with the camp I have to continue eating gluten, daily and soy free to remain acne free? I understand there are many more parts to this program like self love which I need to do but I am still hesitate because I have done a candida type of diet before and it didn’t really help and I love food so its hard for me to give up everything but am willing to do whatever to get clear skin. So I would really like to join the bootcamp and I wasn’t sure where I should ask this question, but I tried to pay here online a little bit ago and the payment wouldn’t go through. I can’t remember exactly the error that came up, but I think it was because I was paying with a debit card, not credit. Should that make a difference? I don’t have a credit card – so I’d be bummed if I could sign up and make the payment! What should I do? I’ve been doing the caveman regimen for about a month now and I’ve seen major improvement of my mild acne. However, my skin is a mess of brown patches, discoloration and blotchiness that is due to the dead skin buildup. I’m pretty pale and no ones really said anything except for my mom who asks me why my face is two different colors. Is this a part of the process? I noticed you also had these patches but mine look a lot darker and are all over like I rubbed in dirt or something! I want to try your program but I’m not sure. Do you think it would finally help me to shed this dead skin and remain acne free? will any kinds of supplements be required during the bootcamp? Like expensive teas, vitamin supplements, detox pills and all kind of (organic) supplement stuff that is hard to find and has to be ordered in a special shop? I have missed out on an amazing deal. 🙁 I sent you an email to support@thelovevitamin.com explaining my situation. Could you please review and get to me ASAP. Thank you Tracie. I’m very interested in participating in the bootcamp. 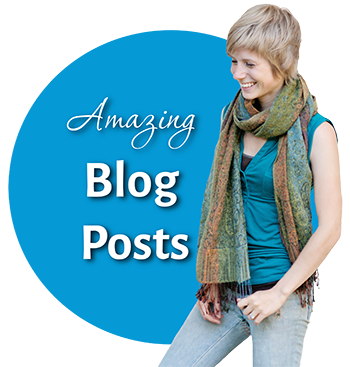 You come across as very genuine and knowledgeable unlike others who try to rip off/scam acne sufferers! Could you provide a bit more info as to what the meal plans are like? The information is a bit vague. Is there a specific ‘category’ they stick to (e.g paleo, cavemen etc?) Thank you! Thanks for your interest in the Bootcamp! The meal plans are a pretty well rounded whole foods diet… so not really a category like paleo, or vegan or anything like that. No processed foods, and the meal plans are dairy and gluten free, and free from refined sugars. Foods that are included are: vegetables, whole fruits, non gluten grains, beans & legumes, coconut products, meat, eggs, seafood …. I think that covers it. For vegetarians there are plenty of vegetarian meals included. I am very interested in participating in your clear skin bootcamp; however, I had a question regarding candida acne. I believe I’ve had candida for about a year as a result of taking antibiotics, birth control, and eating a high carb diet. Unfortunately, I am one of the lucky people to have both internal and external candida symptoms. I have what appears to be pityrosporum folliculitis (tiny, uniform, white pustules) on my chest, upper back, and forehead. Would your bootcamp benefit me and my condition? I have tried 3 months on the candida diet with minimal success. I now take good probiotics 3 times a day and various vitamins to rebuild immunity but I can not get rid of the candida acne. The only thing that helps is applying H&S, Selsun Blue, and zinc pyrithione soap to the affected area. But the results are intermittent and the products are super harsh and dry out my skin. Please help!